If it weren’t for my friend Kathy Brown, I might never have figured out what species I was observing. Identifying this bird stumped me! Ruby Crowned Kinglets are described by the Cornell Lab of Ornithology as a tiny bird seemingly overflowing with energy, the Ruby-crowned Kinglet forages almost frantically through lower branches of shrubs and trees. Its habit of constantly flicking its wings is a key identification clue. 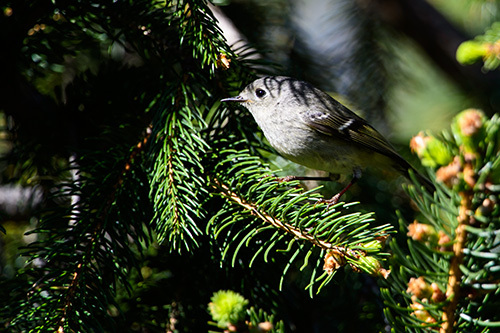 Smaller than a warbler or chickadee, this plain green-gray bird has a white eye ring and a white bar on the wing. Alas, the male’s brilliant ruby crown patch usually stays hidden—your best chance to see it is to find an excited male singing in spring or summer. I don’t think I could have described what I saw any better. This bird moves with the energy and manner similar to a hummingbird. Its help like this that makes birding so much fun, there is always someone like Kathy willing to help. Checkout Birders who Blog, Tweet and Chirp on Facebook. There are some rally great people associated with this community and Kathy is one of them. Thanks for your help Kathy! Image captured with Nikon D4s, 600mm f/4 w TC-e14II on Lexar digital film. 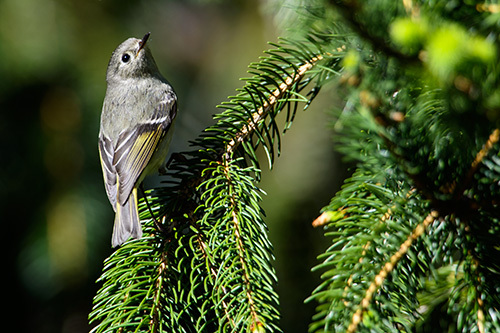 This entry was posted in Birds and tagged bird, image, new canaan, photography, ruby crowned kinglet, vincent mistretta, wildlife on May 27, 2014 by Vincent Mistretta. Vincent, I was happy to help and so pleased you got to see this saucy little bird!